The chorus of learned theological folks spouting the truth about the state of the climate is growing. The site below is from the United Methodist Publication Insight prepared by the church in Mesquite, not the Nashville based headquarters, which is still in denial. Rev. Michael Dowd has presented a powerful sermon on Christianity and its relevance to modern society and how this relevance can be altered to improve man’s role in protecting our environment. It is long, over 1 hour, but absolutely worth your time. Throughout human history, we have seen much killing and other strife between people, protecting “our way of life.” Jesus message of love transcends differences, where people with different personalities and beliefs can respect each other and cease conflict. Jesus message was that you did not have to believe in him but rather all must believe in God. This feeling was recently expressed by Bishop Curry of North Carolina in his sermon delivered at the royal wedding of Prince Harry and Megan Markle. Interestingly, he stated that both he and the bride came through slave ancestors and, by doing this, he put this as an event in history that is over and done with. Living a life based on love is now more important. What religious people really think. Many events in life, and in faith, are statistically driven, i.e.specific outcomes may be desired but in fact many outcomes are unpredictable. 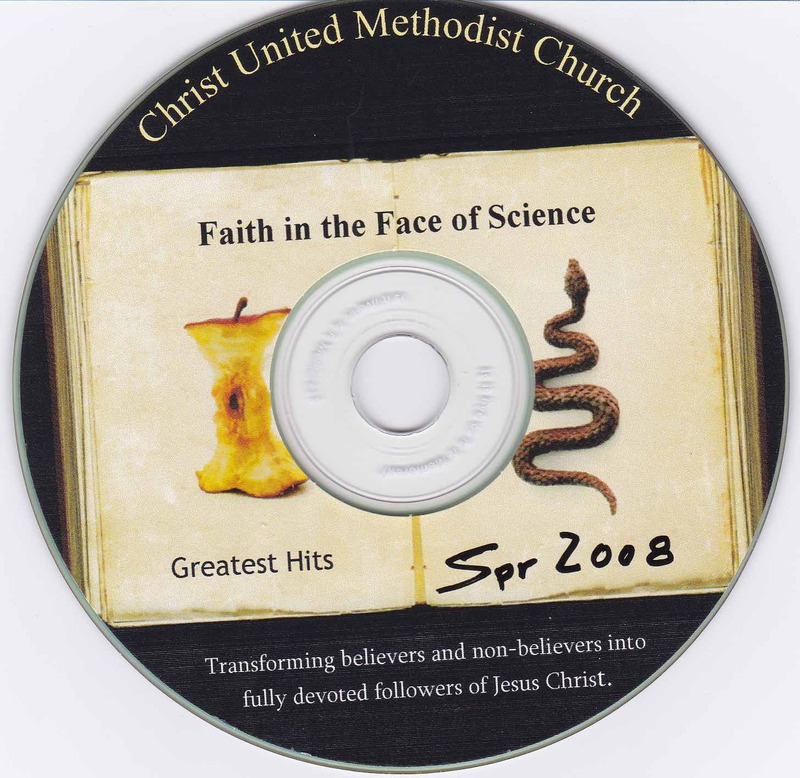 The following is a Power Point presentation given to the Christ United Methodist Church youth in 2010 on this subject and the next is an example drawn from the New Testament where the outcome is not determined (uncertain). The probability of events occurring naturally must be considered in gaining confidence in biblical teachings. In Jesus response to his disciples question in John 9:1-3, he dismissed parents sinning and the man sinning as causes of the man’s blindness. This leaves open a number of naturally occurring events including staring at the sun too long (e.g. Galileo) and industrial accidents such as a vat of boiling oil exploding or being hit in the head with a swinging timber member. Rain Falls on just and unjust (Mat 5:45), as well as the myriad of indecisives in the population. Given the variability of rainfall, this passage is another example of probabilistic occurrences and the concept of uncertainty in Jesus’ teachings. Jesus’ parables are the closest thing that we have of his actual thoughts. The following is the result of an analysis of the parables, identifying topics which are mentioned indicating that his exposure to life experiences extended to a wide variety of topics, most likely during his working years, before he began his ministry. The Parables are not dogmatic, but rather are a view on how life can be lived with your fellow human. The rank order indicates the frequency of a particular topic being addressed in these parables. The parables are linked to Jefferson’s Bible as well as Barclay’s book on the subject. Note that the top occurrence (Group A) is for Christian Life, Faith and Discipleship. Group B (2-5) contains topics for daily living including intellectual decisions, nature and business and salvation and the kingdom of heaven. Finally, Group C deals with science and math, forgiveness, humility and pride, charity, justice and finally, construction practices, material properties and family. The presentation below traces the initiation and evolution of the cosmos from the initial Big Bang to present day. The Power Point file is downloaded to your computer. 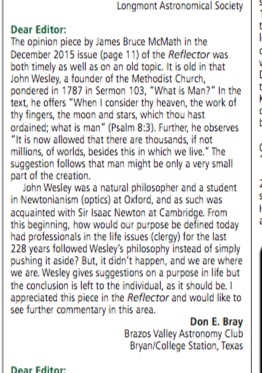 An editorial in the astronomy journal Reflector and a Letter to the Editor in astronomy publication Reflector cited below gives some insight into the factors involved in observing faith matters in science. Following this is a citation to the book Modern Physics and Ancient Faith by Stephen M. Barr, which goes more deeply into the subject. If we follow the business as usual pattern of life on Earth, there is a sure route to extinction within a few hundred years. Below, Rev. Michael Dowd presents steps that can be followed to assure there is a future for Mother Earth. The National Association of Evangelicals (NAE) asked a small, but impressive group of authors to bring science and faith on the same page. 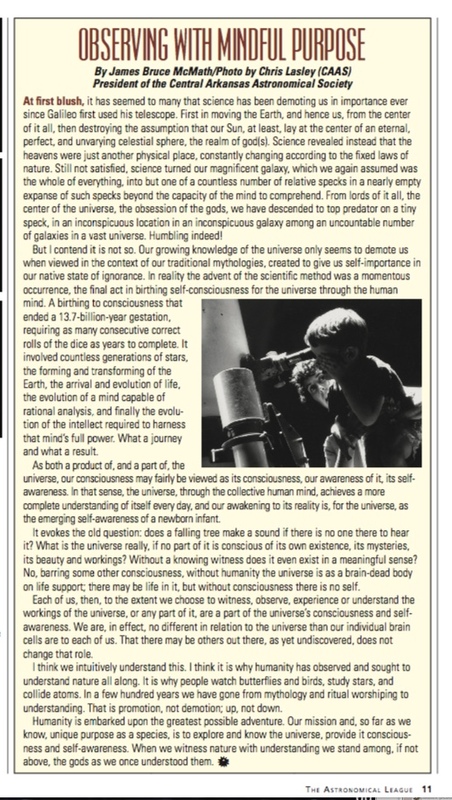 The booklet linked below does not answer all the questions, but it unites the conversation in a way that values and respects both faith and science. At the wedding, Jesus’ admonition about not putting new wine in old wineskins and patching burst skins shows an appreciation of the laws of science in container storage, as well as in material properties. Although the discussion is strictly about delivering good wine to the wedding feast, there certainly can be other implications. New, freshly squeezed wine will contain pulp and grape skins which will tend to plug the pores of the skins and the walls will become brittle, non flexible. In that event, gas from the further fermentation process cannot escape and the pressure will build. More brittle materials are more prone to burst when handled and when overpressurized. A burst skin can be repaired much like a bicycle innertube but the flexibility (elasticity) of the parent material and the patch material must be close to the same lest the joint initiates a crack and further failure occurs. Interestingly, this principle was being applied at the time by Roman engineers in designing earthquake resistant structures. Why was Jesus group enjoying the party and not fasting; could be that he was simply acknowledging one of the laws of life? The festive atmosphere prevails at the reception (feast) while the bride and groom are there, but it changes significantly when they (the bridegroom) depart. The party is over. One interpretation of this parable is that in any action, one should collect all of the facts and be governed accordingly, i.e. make your actions consistent with the laws of science and laws of life. This liberal interpretation of scripture is merely to demonstrate where the laws of science have played a role in societal events. In this case, Jesus in his early life must have observed happenings demonstrating these laws. New Testament, Matthew 9:14-17, Mark 2:21-22, and Luke 5:37-39. The wineskin warning appears earlier on in Job 32:19 in the Old Testament (around 1000 BCE). The solution to the wine processing problem would be to filter the skin and pulp from the juice before placing it in the wineskins so that only the purest liquid is used. The pores of the wineskins then would remain free to vent the gas produced in the fermentation. 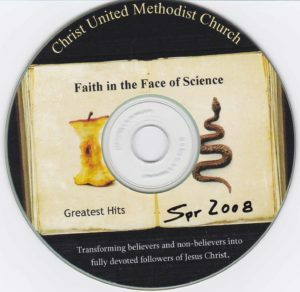 A series of invited lectures was presented for the Faith in the Face of Science program at CUMC. Slides from some to the presenters are given below. Dr. Don McLeroy, Chairman of the Texas Board of Education describing his position as a creationist. Presentation of video on the Star of Bethlehem with discussion led by amateur astronomer Dr. Mark Spearman. Tour of the TAMU Nuclear Science Center to learn about nuclear power. Tour of the Gibbons Creek Coal Fired Power Plant to learn about electric power generation. Tour of the Brazos Valley Museum of Natural Science. – Owen Gingerich, God’s Universe, The Belknap Press of Harvard University Press, Cambridge, Massachusetts, 2006, p. 39. New Testament, Matthew 12-32. The Harper Collins Study Bible, New Revised Standard Version, National Council of Churches, 1989. Barr, Stephen, Modern Physics and Ancient Faith, Notre Dame Press, Notre Dame, Indiana, 2003, 312 pp.